i-Studio, powered by Shimadzu, is an ‘Integrated Workflow Automation’ concept which is a synergistic combination of core technologies - intelligent instrumentation, smart software and automation algorithms – all converged into one seamless integrated workflow in the laboratory! i-Studio takes productivity to a new peak by the powerful concept of ‘Integrated Workflow’ management. This extends beyond the HPLC and encompasses the entire instrumentation right from mobile phase & sample preparation, various analytical techniques used for the manufactured product as per pharmacopoeia procedures and all the way to reporting of results. All of this is seamlessly integrated into one smart workflow with single point data management and automated calculation routines. 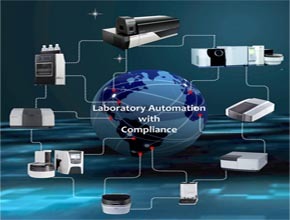 As an example of a typical QC lab where for any final product release testing, there would be a few mandatory equipment utilized such as weighing analytical/semi-micro balances, UV spectrophotometer, FTIR, GC with headspace, HPLCs, Autotitrator, pH meter, etc. The i-Studio enables seamless integration of all these essential equipment, irrespective of their make, into one integrated workflow which is intelligently managed in a compliant environment by the ‘i-Studio Automation Server’.The i-Studio integrated approach enables automated custom calculations as per customer templates by seamless data capture from various instruments eliminating manual intervention. This assures traceability and also significantly enhances lab productivity.